Let's do the long vowel shuffle! Have some fun unscrambling these long vowel words. Which long vowel does each word have? If your first grader needs help differentiating between short and long o, this worksheet can help. Got an aspiring sailor on your hands? 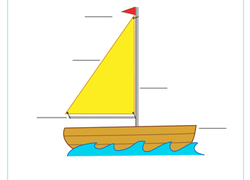 Before he can set sail on open waters, test your kindergartener's understanding of a boat's parts.